This gold pendant offers a way to own a truly original piece of jewelry. It is a medallion designed to your specifications. You choose the three letters in the monogram as a way to personalize the piece. 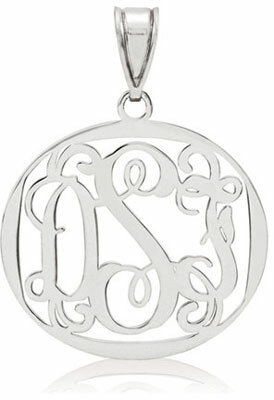 The Filigree Monogram Medallion Pendant in 14K White Gold is the perfect way to make an original statement in jewelry. This charming monogram pendant measures 28mm by 25mm (not including bale) and is cast in 14K white gold. The ornamental lettering makes the entire piece stand out, drawing in the eye in order to read it. Each letter is expertly cut into the gold in a way the ties it to the other letters and attaches to the outer gold border. This border around the letters acts like a picture frame and provides a base for the chain bale on top. This lovely pendant is finished to a high polish, allowing the precious gold properties to shine through.